John Wesley made one mission trip to what became the United States, where he managed mostly to alienate masses of people in the Georgia Colony, from which he finally escaped with his life. If he could somehow come back to America as it is today, one thing is clear to anyone familiar with Wesley’s passion for social justice and his heart for the poor: he’d be appalled at the way our poor and homeless are shunned, demonized and scapegoated for so many of the nation’s social and economic woes. 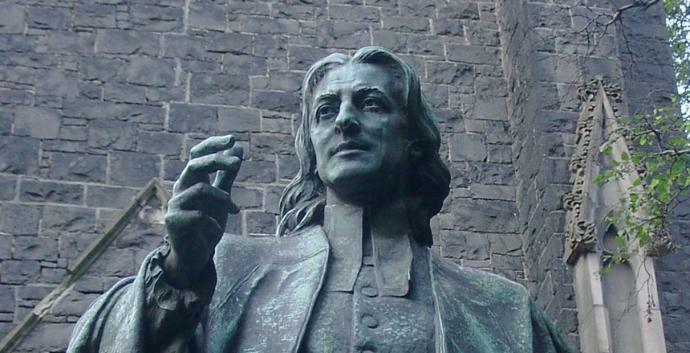 Brother John Wesley prowled the dark, back alleys of London, “hearing the cries of beggars” and giving them alms that he had begged for. He insisted that “the people called Methodists” put faith and love into action and that meant acting to lift up the poor in small, personal gestures as well as ministries that reached the marginalized masses. Note that the love thing rates No. 1 on the list. And that raises the question: What does Christian love look like? St. Augustine put a face and body on love when he said it has hands to help others, feet to hasten to the poor and needy, eyes to see misery and want, and ears to hear the sighs and sorrows of others. By that measure, Rev. Wesley embodied love. Throughout his long life (1703-1791) he ventured into the streets of London, sometimes begging for alms for the poor and other times handing them out to the beggars and vagrants he came across in the dark alleys. After each encounter with one of these street people, Wesley would bid farewell to the person with a tip of his hat. Even though Wesley is high on my list of faith heroes, I don’t recommend that anyone in this day and age venture out alone into dark city streets giving handouts to the poor. There are better and more effective ways for engaging them. Evangelism is all about the different ways of inviting people–rich or poor–into God’s fold. In God’s eyes, nothing good comes from denigrating (dis-inviting) the poor and assuming the worst about them. Good comes from seeing, hearing and encountering them–giving them some kind of respectful, glad-to-meet-you tip of the hat.